Welcome to a Whole New Level of Awareness! Whether you currently have a healthy companion, or are desperate and discouraged by expensive and unsuccessful vet treatments for allergies, itchy skin, and more; the products on this site and information in “Simple Steps to a Healthy Pet” and the articles and blog on the site are what you have been searching for. They will not only save you thousands of dollars over the lifetime of your companion, but possibly his life! 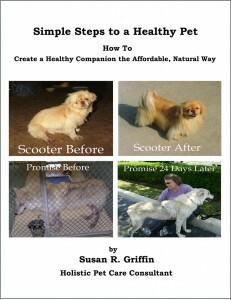 They already have for many, like Scooter and Promise on the book cover, who have come to Naturals for Animals and spoken with Holistic Pet Care Consultant, Susan R Griffin and her staff. How to Get Rid of Pet Allergies and Itchy, Smelly Skin Problems. How to Create Healthy, Shiny, Soft, Fragrant Coats Without Using Multiple Shampoos, Sprays and Conditioners. How to Get Rid of Costly Vet Bills! 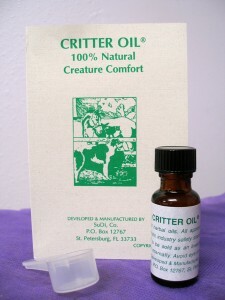 Read the Book, Use the Products and Create Healthy Pets the Affordable, Natural Way!